Traveller Accommodation Services Price Index — N.L. Traveller Accommodation Services Price Index (year-over-year change) — N.L. Traveller Accommodation Services Price Index — P.E.I. Traveller Accommodation Services Price Index (year-over-year change) — P.E.I. Traveller Accommodation Services Price Index — N.S. Traveller Accommodation Services Price Index (year-over-year change) — N.S. Traveller Accommodation Services Price Index — N.B. Traveller Accommodation Services Price Index (year-over-year change) — N.B. Traveller Accommodation Services Price Index — Que. Traveller Accommodation Services Price Index (year-over-year change) — Que. Traveller Accommodation Services Price Index — Ont. Traveller Accommodation Services Price Index (year-over-year change) — Ont. Traveller Accommodation Services Price Index — Man. Traveller Accommodation Services Price Index (year-over-year change) — Man. Traveller Accommodation Services Price Index — Sask. Traveller Accommodation Services Price Index (year-over-year change) — Sask. Traveller Accommodation Services Price Index — Alta. Traveller Accommodation Services Price Index (year-over-year change) — Alta. Traveller Accommodation Services Price Index — B.C. Traveller Accommodation Services Price Index (year-over-year change) — B.C. Traveller Accommodation Services Price Index — Y.T. Traveller Accommodation Services Price Index (year-over-year change) — Y.T. Traveller Accommodation Services Price Index — N.W.T. 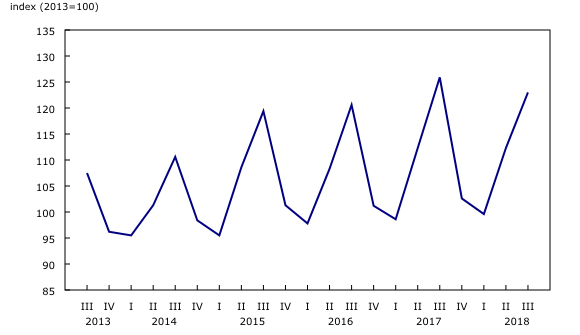 Traveller Accommodation Services Price Index (year-over-year change) — N.W.T. Traveller Accommodation Services Price Index — Nvt. Traveller Accommodation Services Price Index (year-over-year change) — Nvt. The Traveller Accommodation Services Price Index (TASPI) rose 9.5% in the third quarter. The index has increased in the third quarter of every year since its inception, as accommodation prices generally rise in the spring and summer months due to higher seasonal demand. Higher prices for both leisure (+10.3%) and business (+8.7%) clients were responsible for the increase. Prices for traveller accommodation services were up in eight provinces and all three territories. Higher prices in British Columbia (+14.8%), Ontario (+7.1%) and Quebec (+14.8%) contributed the most to the increase. Falling accommodation prices in Manitoba (-2.6%) and Saskatchewan (-2.9%) somewhat moderated the rise. Prices for leisure clients rose 10.3% at the Canada level, largely due to increasing prices in British Columbia (+15.8%), Ontario (+7.6%) and Quebec (+17.7%). Price declines in Manitoba (-2.6%) and Saskatchewan (-3.8%) moderated the increase. Prices paid by business clients increased 8.7% at the Canada level. The rise was driven by higher prices in British Columbia (+13.3%) and Ontario (+6.6%), and was partially offset by lower prices in Manitoba (-2.5%) and Saskatchewan (-2.0%). The TASPI decreased 2.3% in the third quarter compared with the same quarter in 2017. Prices declined in 2018 after record prices in 2017 coinciding with Canada's 150th celebrations. Decreasing prices for both leisure (-2.7%) and business (-1.8%) clients contributed to the fall. Lower prices were reported in all provinces, led by Ontario (-2.9%) and Quebec (-2.7%). These decreases were partially offset by higher prices in all three territories, driven by Yukon (+9.3%) and Nunavut (+15.6%). The Traveller Accommodation Services Price Index (TASPI) measures the monthly and quarterly price movements of short-term accommodation services. This index reflects changes in room rates (excluding all taxes) and covers hotel and motel lodging services. Separate index aggregations are available for Canada, the economic regions, provinces and territories, by major client group. The contribution of a given sub-aggregate to the composite price change depends on both the price change exhibited by the sub-aggregate and on its importance in the basket, as measured by the weight. The index is not subject to revision and is not seasonally adjusted. "A Historical Timeline of Canadian Producer Price Statistics," which is part of the Prices Analytical Series (Catalogue number62F0014M), was created to showcase the key milestones in the history of Canadian producer price statistics. This historical timeline contains answers to questions such as: Who collected Canada's first statistics? What do Canadian producer price indexes measure? The infographic "Producer Price Indexes at a Glance," which is part of Statistics Canada — Infographics (Catalogue number11-627-M) demonstrates how producer price indexes for goods and services are calculated and why they are important for the Canadian economy.